Very informative article. In addition to keeping a copy of any request for changes or alterations in file, I also copy and paste their request directly into my report. This has made some Underwriters very uncomfortable and requests for changes have dropped dramatically. I appreciate the article and my best to Mr. Dingeman in his “David vs. Goliath” battle. I would say that this is not just “his” battle, but every appraiser who works hard to do the right thing with integrity. Chase is wrong on so many levels it just makes my blood boil. Unfortunately for him, my experience (with Chase) indicates this is protocol and he is going to need a great real estate lawyer. They abuse their use of blacklisting good appraisers without reasonable dialog for defense, and no statute of limitation. Not to mention they are giving him the death penalty for doing what he is required to do. We need leaders in this industry or there will be no appraisers left in 10 years. Chase has a legitimate need for the appraisal information, BUT they went about it the wrong way. They could have relayed information requests through the original client, OR they could have provided the appraiser with the copy of the assignment whereby the client specifically authorized the appraiser to communicate with them in matters related to the appraisal. Chase has a habit of non USPAP compliance. The extra step in going through the “real” client is necessary because many lenders (including Chase) attempt to hold the appraiser responsible for conforming to THEIR appraisal policies after the fact. IE- “we require so many comps; or we require an income operating expense statement and rent survey on all non owner occupied property” when that was never part of the original contracted service. 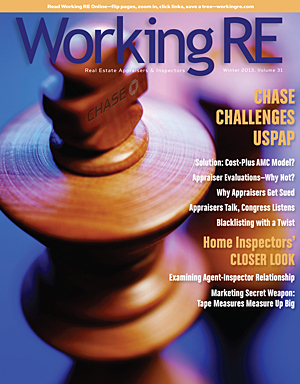 The appraiser needs to file a complaint against Chase with the new Consumer Finance Protection Bureau.